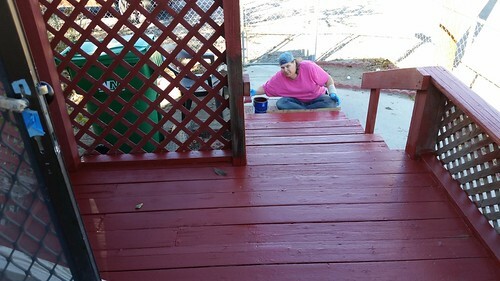 After the disappointment of missing the Business Train for the nice video shot, Lisa went back to painting the north end of the front porch. She used up most of a can of paint on this and got a whole lot done. This is the area she prepped yesterday and that I photographed then. She got all of this done. This picture was as she was finishing up the lowest of the north steps. Using the last of the paint in this can (there's one can left, plus a small amount in one other), Lisa got as close as she could to the front door while still leaving us an "escape route" to the right. 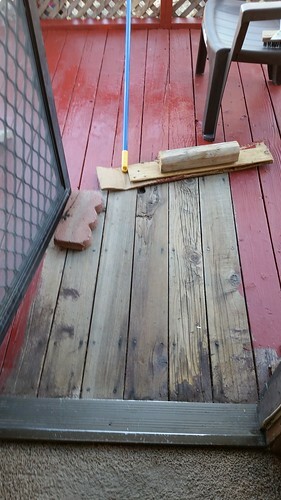 Aside from the space in front of the front door (which will probably be the most challenging part of the whole job since it has to be done in bite-size pieces so we can still come and go), the deck of the porch is done, along with all of the steps. After Lisa gets this tricky part done, she can start considering redoing the sides of the porch, and maybe the trellis, unless we decide to replace the trellis entirely due to how worn it is.